RAS Sound Simulators are analogue systems designed to simulate locomotive sounds and synchronise them with the model locomotive type, speed and acceleration. Twelve custom-built systems have been installed on individual layouts to specific requirements. Enquiries can be made to: Robert@RosewarneJunction.me.uk As a rough guide of available options, the following brochure is available for download. The core sound simulator configuration comprises the Steam Sound and Whistle Unit connected to one or more speakers. This low-cost simulator will synchronise the steam-sound ‘chuffs’ to the voltage on the track, with adjustments allowing the operator to fine-tune the synchronisation to the speed of the locomotive. Compatibility with controllers: The sound simulator uses the track voltage but rectifies and smoothes it before using it to determine ‘chuff’ rate. Hence, either smooth DC or pulsed controllers can be used with this system. START. Controls the track voltage corresponding to the start of ‘chuffing’. RATE. Adjusts the relationship between rate of ‘chuffs’ and track voltage. CUT-OFF. Controls the length of each ‘chuff’. HISS. Volume of the background steam ‘hiss’ when a loco is at rest. TONE. Filters the ‘chuff’ sound to give give different characteristic tones. BLOW-OFF Makes the sound of a safety valve lifting and steam escaping. WHEEL-SLIP Applies, when starting, sudden increase in rate with a decay back. +LOW. Lower pitch whistle if depressed when WHISTLE is pressed. +DISTANCE More distant whistle if depressed when WHISTLE is pressed. CHUFF RATE Internal control of speed using a potentiometer. AUTO-COAST Turns on automatic reduction in chuff volume for coasting or braking. This system incorporates all of the features of System 1 plus an additional Diesel-Electric plug-in board. The sound of the engine is simulated using a background tone with additional sub-harmonic components at lower fractional frequencies. These components can be individually added to simulate different numbers of cylinders in the engine. An adjustment is provided for the pitch of the sound at idle speed (speed of the engine). The pitch of the sounds then increases with track voltage. Synchronisation is not such an issue with a Diesel-Electric and so there are no controls for this. The Horn is a two-tone horn with adjustable pitch on each tone. Compatibility with controllers: As for the Kit RAS1: Steam Sound Simulator. IDLE SPEED. Controls the pitch of the diesel sounds when track voltage is zero. SUB-HARMONICS. Control over the sound of the engine, particularly useful for obtaining an authentic sound at low speeds. HORN HIGH. Diesel Horn at the higher pitch. HORN LOW. Diesel horn at the lower pitch. These options are actually plug-ins to the steam sound simulator board and therefore can be used with any of the kits. This unit plugs into the Steam Sound Simulator but affects both the steam and diesel units. The basic idea is that all the parameters that need to be different for each locomotive (tone, chuff start, rate and cut-off, and whether steam or diesel sound should respond to the speed of the loco) are operated from one setting of a multi-pole rotary switch with allowance for up to 12 locomotives. There are also several other controls that are useful to have near to the signalman or station-master’s control position. 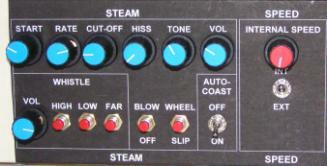 An example of the front panel of such a remote control (in this case just for steam) is shown below. The remote control can have as many or as few of the above additional controls as required. They are all wired through to the remote control box via a 25-way ribbon cable, and can be connected to switches if desired. WHISTLE Simulated steam whistle sound. +LOW. Makes whistle pitch lower. Simulating the effects of sound propagating over large distances and reflecting off buildings and terrain such as cuttings, hills etc, requires the addition of some ‘reverberation’. The least expensive method for doing this is by using a ‘spring line’ and associated mixing amplifier to mix in just the right amount of ‘echo’. These spring line units have to be imported and built into an enclosure incorporating the mixing amplifier and power supply as well. The unit has input and output connectors for the audio signal and controls for volume and reverberation content. It is recommended that this unit should be used between the sound simulator and the speakers or any distribution unit. This will feed the audio signal back into the track, making it available for playing through small on-board speakers in the trains. A choke will be needed between controller and track to stop the audio-frequency signal affecting the controller. In addition it may be necessary to use two back-to-back diodes near the track feed if locomotives with very low start voltages are used. Compatibility with controllers: If on-board sound is used with pulsed controllers, the pulsing of the track voltage (most pulsed controllers use 50 to 100 Hz) will be converted to an audible signal by the on-board speakers. It is possible to filter out the pulsed-controller frequency prior to the speaker using a capacitor and by using a small speaker that has a very low response to these frequencies..
Option D: 7W Mono Amplifier. If the system is to be used with Passive speakers (without additional amplification) then this amplifier is recommended. Outputs are then provided both with and without amplification. The sub-woofer box contains an amplifier that drives both the subwoofer and the two full-range satellite speakers. The satellite speakers are magnetically shielded, making them suitable for use near a TV or monitor. Input is via a 3.5mm stereo socket and the system is powered by a plug-in mains adaptor (supplied). The Specification for these speakers will depend on the scale and amount of room available inside the locomotive, and whether a pulsed controller is to be used.